Transportation technology is progressing at a much slower pace than some of the other sciences such as information technology, biotech, and nanotechnology. As an example, the world’s human speed record was set in 1969, a full 37 years ago, when Thomas Stafford, John Young, and Gene Cernan flew in Apollo 10 at 24,790 mph. While there is much talk about flying at a speed that approaches the speed of light, very little effort is actually being expended in this area. However, transportation technology is about to move ahead more rapidly in the coming years with the advent of two radically new technologies – frictionless vehicles and binary power. Throughout history we have learned that the two principle driving forces of humanity are freedom and control. While current automotive technology gives us the freedom to drive as fast or slow as our vehicle will take us, and control over our timing and direction, we are still restricted to driving on the ground and we have a hornet’s nest of laws to contend with regarding speed, flow, and operation. Understanding the “freedom and control” drivers is key to understanding the future of transportation. Any new forms of transportation that do not measurably improve our sense of freedom or give us added control of our lives will likely fail in the marketplace. In the near future, automotive companies will focus on fully automated vehicles where people can “punch in” or “speak” the place they want to go to and the vehicle will automatically take them there. This “control feature” will open up huge additional markets for automotive companies to sell to the elderly, families with kids too young to drive, and the visually, physically, and mentally impaired. The arrival of fully automated navigation systems for ground-based vehicles will set the stage for fully automated navigation systems for flying vehicles. Here are a few other transportation landmarks that will help pave the way for the more significant innovations. By 2010 personal transportation devices will be all the rage and electric shoes with built-in roller-skates will be gaining much of the attention. After nine years of heavy media coverage, the Segway Human Transporter will begin to gain serious market share. By 2015 traditional gas-powered autos will start to decline with electric automobiles and hybrids taking up most of the slack. By 2020 we will see an industry being built up around self-illuminating highways – highways that glow in the dark. “Glow Roads” will dramatically change the night-time aesthetics of major cities and will be shown to improve driving safety at night and reduce the need for streetlights. By 2025 a first attempt at launching the space elevator will fail, setting the industry back a decade. Around 2030 we will see commercialization of the first friction-free no-moving-parts flying vehicles which will be considered by many to be the ultimate freedom machine. Much like the transition from analog to digital in the world of information technology, the study of traditional mechanics and traditional aerodynamics will be replaced with a new physics governing vehicular movement. Even today, flying cars are very much on the radar screen to become a next generation automotive technology. They will begin with a more convenient version of today’s airplanes and eventually converting over to the frictionless cars. The flying car era will really begin around 2015 with flying drones. Flying drones will be used by FedEx and UPS to deliver packages, Pizza Hut to deliver pizzas, and Kroger and Safeway to deliver groceries. But beyond that, drones will enable homes to be taken off the grid with delivery of water and electricity (changing out batteries for the home), trash and sewage pickup, and much more. These too will begin as air-powered vehicles and later convert to frictionless drones. Six key technological breakthroughs will be needed for the first generation of flying cars to become viable – the fully automated navigation systems, directional layering of airspace, low-impact vertical take-off, convenient fly-drive capability, silent engines, and specialized safety systems. Fully automated navigation systems – The average person has a difficult time navigating on a two dimensional surface. The flying car industry will not be able to “get off the ground” without an onboard navigator that “handles the driving”. Yes, people will want the freedom of being able to do some creative maneuvering in certain situations, but that will only be allowed in rare instances. Directional layering of airspace – With several hundred thousand vehicles flying over a city, there will need to be an organized system for managing the traffic, and having all vehicles at a particular altitude traveling the same direction would eliminate many problems. For example, all vehicles traveling at 1,000 ft altitude would be traveling due north, at 1,010 ft altitude 1 degree east of due north, 1,020 ft altitude 2 degrees east of due north, etc. Vehicles would spiral up or down to make their turns. While not a perfect solution because the North Pole becomes a crash point for those flying due north, it does represent a good starting point for engineering a solution. Low-impact vertical take-off – For use by the average person, flying cars cannot have a runway requirement. They need to take off and land vertically without blowing the leaves off of trees or shutters off your house. Convenient fly-drive capability – As humanity makes the transition from ground-based autos to flying cars there will be a need for both driving on the ground and flying in the air. Silent engines – Very few cities will want to put up with the noise of several hundred thousand flying vehicles if they all sound like airplanes today. Specialized safety systems – To date both aircraft and airspace have been closely controlled by organizations like the FAA and the NTSB to insure the safety of the flying public. Because of the sheer volume of vehicles and the lower caliber of individuals allowed to fly, additional safety measures will have to be in place. Safety technologies will include collision avoidance systems and drop-out-of-the-sky emergency airbags on the outside of vehicles. The friction-free no-moving-parts vehicles will run on what we call “binary power”. Binary power is the concept where two otherwise harmless beams of energy will intersect at some point in space creating a source of power. To better explain binary power, think in terms of two invisible beams intersecting in a room and the point at which they intersect is a glowing point of light. 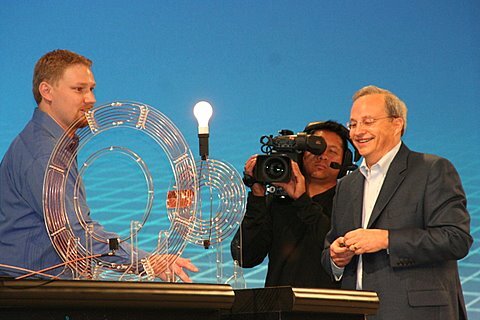 Yes, binary power will eventually replace all light bulbs. And lest you think it can only be used for intense forms of power, it will also be used to create “points” of sound, eliminating the need for speakers and headphones. With power being beamed in, the cost, weight, and manufacturing complexity of these vehicles will be greatly reduced. For this reason the industry will go through a very rapid conversion leaving the mechanical masterpieces we know as cars today destined for the scrap heap. By 2050, because of friction-free technologies and advances in material science, the average passenger vehicle will weigh less than 200 lbs. By 2050, because of automation, far fewer pieces, and greatly reduced complexity the average manufacturing time for a vehicle will be less than one hour. By 2050, the cost of the average vehicle will be under $5,000 in today’s dollars. By 2050, because of the use of automated navigation systems, traffic courts will be a distant memory. Once the flying car industry takes off there will be a gradual decaying of the existing highway system. Eventually highways will go away, starting around 2070. Frictionless engines will form the basis of new propulsion systems for space travel. By 2050 we will have fully functioning space elevators operating at full capacity, moving both people and supplies into space. By 2050 over one million people will have visited the moon. By 2050 several dozen space hotels will have made a major impact on tourism with growing numbers of people opting for the “sleeping with the stars” vacation package. By 2050 several space stations will have been started as small working cities to build the next generation of space-based industries. The power that drives vehicles will transition from oil to electric and later to binary power. Electric vehicles will start to make major market inroads around 2015 because of improved battery technologies and because of the fact that the electric infrastructure is already in place for rapid “refueling”. Hydrogen will make some inroads but will not become anything more than a niche industry. By 2050 oil and gas will remain plentiful as demand drops precipitously with the emergence of alternative sources. Oil & gas will remain as an energy source, but will only be used in niche industries. By 2050 the automotive industry will make a near-complete transition to binary power as a principle source of vehicular power. By 2050 space-based power stations will be operational, supplying a significant percentage of the world’s power needs. By 2050 nearly all light bulbs will have disappeared, replaced with binary power creating points of light in space. While individuals will be striving to gain control, our countries and governments will begin to see their control slipping away. The Internet has created borderless economies that have confused the issue of power and control and even the sovereignty of nations. With the Internet’s ability to conduct business and perform flawless transactions across borders, countries have essentially lost control of commerce. Flying cars will take this one step further and countries will begin to lose control of their citizens as national borders become meaningless. While it is possible to visualize “electronic borders” formed around the perimeter of a country, cloaking devices and other types of system hacks will quickly render that kind of system useless. By 2050 the Nation-State as we know it today, will be replaced by a new form of governance. By 2050 there will have been a “peeling apart” of the law-of-the-land and the law-of-the-people. People will always demand solutions for ownership issues related to property rights, but individuals will become highly mobile entities requiring a new form of global governance tied to an internationally recognized ethics standard. By 2050 we will see a number of virtual, non-land-based, countries come into existence, each attempting to gain international recognition and citizens from around the world. The future of transportation will be derived by strong desires for personal freedom and people’s need to gain control over lifestyles that are moving faster and faster. At the DaVinci Institute, our goal in writing “2050 and the Future of Transportation” was to help stimulate thinking and hopefully make it controversial enough to cause these topics to be debated. While we did manage to turn our crystal ball on high beam for this exercise, there are many optional paths that we could potentially go down to cause a different outcome. Please take some time to challenge our assumptions, and let us know what you think.